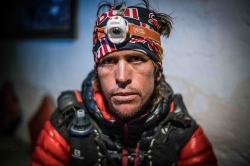 Ryan Sandes and Ryno Griesel have reached the town of Jiri on their FKT (Fastest Known Time) attempt of Andrew Porter’s route on the Great Himalayan Trail across Nepal. By this morning they had completed 1098km, leaving just over 300km to go until they are done, which will hopefully be this week! They have had a tough few days, Ryan has struggled a bit with tummy issues and Ryno has still been battling with injury and his frost bitten fingers– which hopefully he won’t lose any parts of! “It feels like we have been going for an eternity, the last 2 days have been especially rough as I have been struggling with my tummy. The last 300km have been mentally quite draining and Ryno and I have dubbed it the Graveyard shift, but having reached the town of Jiri has been a great milestone we can tick off our list. "This has been the biggest adventure of my life and far more challenging that I ever imagined it could be on so many levels. I was joking the other day with Ryno saying that this crossing has been such a huge adventure, but at the same time so overwhelming that I have almost been tempted to say it might be easier to go back to a 9 to 5 corporate job! There are two new articles up on the Red Bull tracking site www.redbull.com/ght2018 with some more insight into their crossing from Dean Leslie from The Wandering Fever who are filming their attempt.